I am here for your rescue and this is the basic makeup of an espresso machine. 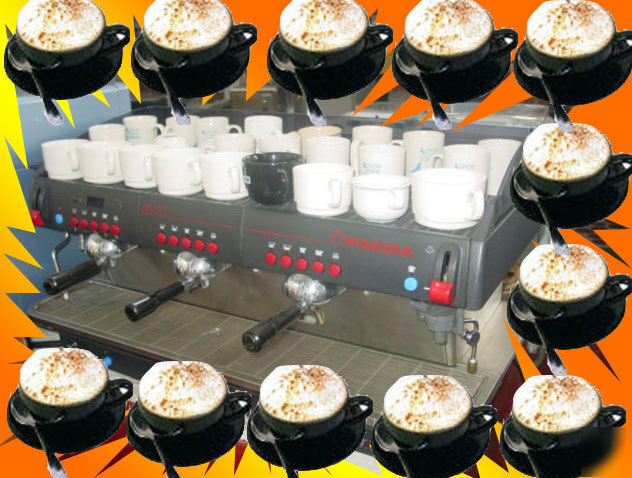 An espresso machine is a device that at a push of a button will push through fine ground espresso for twenty seconds and the result is one or two shots of that liquid called espresso. the machine then provides you with a source of steam with which ( providing you know how, and believe me you don't need to go and get a master at MIT) you can prepare the milk for an eventual combination with the espresso you made that is sold under the name Cappuccino, Latte,Mocha.............etc. Machines tend in some ways to be related to computers in the fact that with computers we say "Information In-Information out", " Garbage In - Garbage Out", in this case good espresso blend in-good espresso out, bad blend in -lousy drink out. Ofcourse , in this all equation the grinder plays a very big part , since the grinder determines the twenty seconds shot .Agree or disagree you are welcome to give Domenic a call @ and he will be very happy to give you extensive explanation of every word in the above composition.